There are times that typing on your iPad is not appropriate. This can be because you should be doing something else… like driving. Why not record a bit of audio, the iPad has a built in Mic and there is FREE software. Then take that recording and either email it or have it translated to text. QuickVoice Recorder was just updated to work on the iPad… not really a lot to do on the app other than make your list of recordings fit on the screen. But, it reminded us that we are not using all the features available to us on the iPad. QuickVoice Recorder launches quickly with a list of your past recordings and large buttons to start your new recording. When recording you can pause or stop. After you finish, you can rename or delete the recording. Finally, take your recordings and email them from within the app. Recording audio comes in handy at meets at well… of course your supposed to warn people in meetings that your recording them. But, you have the iPad sitting right there, pretty handy to tap the icon and record that speech to reference later. 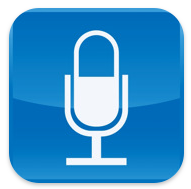 The creators of QuickVoice offers a Pro version that will translate your recording to text. Logically named, QuickVoice2Text is currently listed in the iTunes app store as a iPhone and not a iPad app. Keep an eye on this app, we’re sure the developers will update to run on both hardware options. 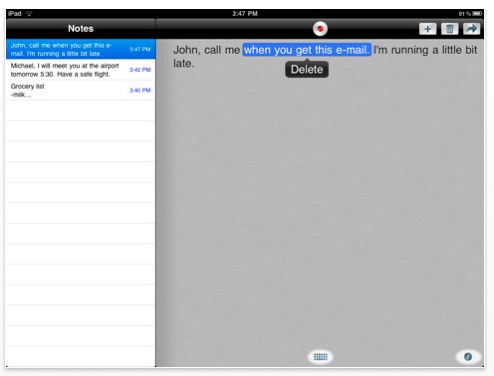 Recording is similar to QuickVoice, but if the recording is short you can choose to email the audio translated to text. There is another option for recording small bits and having it translate to text. You may know the name Dragon Dictation from your desktop computer… they also have a iPad version of their software. Instead of recording audio, saving, then having it converted to text. Dragon takes smaller chunks of your audio and translates it. The strength of using Dragon Dictation if you want your audio into text is it’s tools for correcting dictation it gets wrong. This isn’t for recording meetings, but for small bits of audio you want to distribute as text it works very well. Free is nice too!